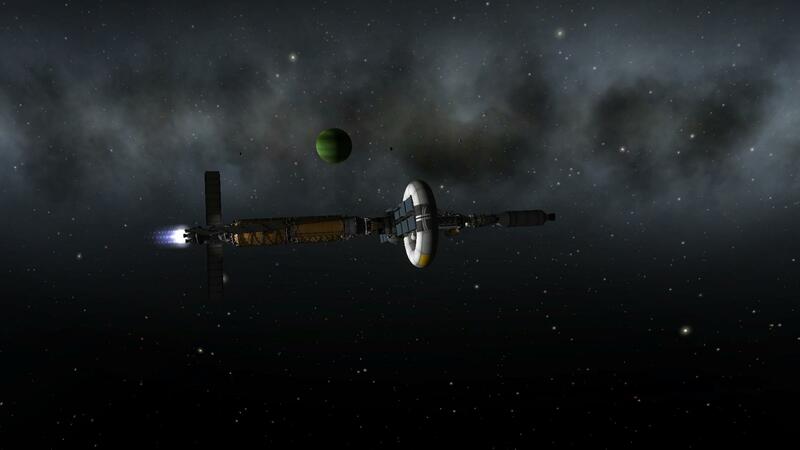 Continuing my extended weekend in KSP, I left off yesterday with the crew of the Jool Explorer 1 starting their two year journey to the outer edges of the Kerbol system. I time warped the game through most of that journey, slowing down to complete a few research missions and check in on a science lab in orbit around Kerbin’s second moon, Minmus. I use a mod called Kerbal Alarm Clock which is invaluable when running multiple missions at once. It does just what it sounds like it does. I can set alarms for various events like a ship is coming up on a sphere of influence change or a maneuver node. In this case I had an alarm set to remind me when the JE1 was getting close to Jool’s gravity well. Getting to your destination is only half of the challenge for interplanetary travel. You also have to slow down somehow to get into orbit. 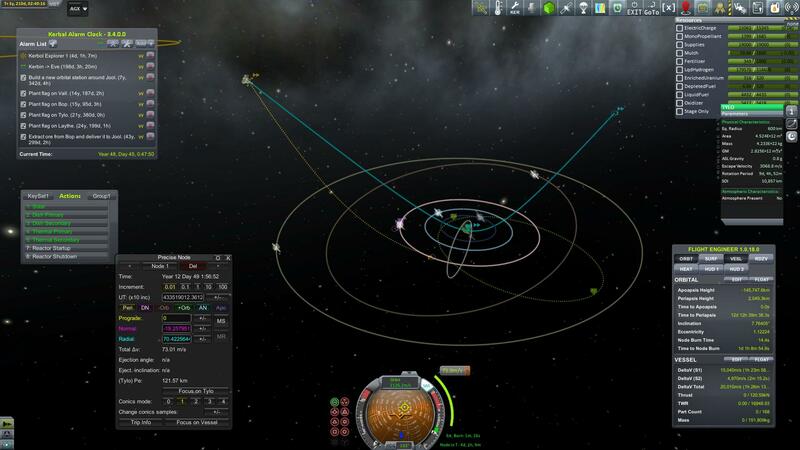 In the above picture the solid blue line shows the trajectory of the JE1 coming into the Jool system and then escaping. Not only that, but the ship would have picked up a little velocity because of how it was passing Jool. In previous versions of KSP, the easiest way to get into orbit of Jool was called aerobraking, and involved dipping into the upper layer of Jool’s atmosphere and using that to slow down. In the current version that just causes you ship to overheat and explode. Instead of using atmosphere, it’s possible to use gravity. Jool has three decent sized moons with nearly Kerbin levels of gravity, which makes them excellent candidates for this. In the map screenshot above there’s a maneuver node at the top left of the blue orbit which creates the new dotted orange orbit. That orbit intersects with Jool’s third moon Tylo (which is highlighted in a peach color). 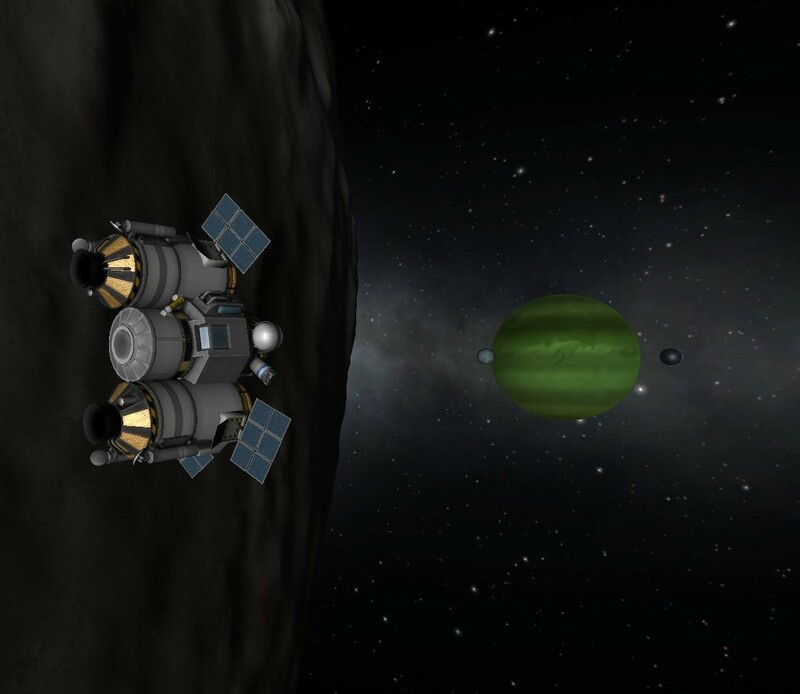 Because the JE1 comes in on the backside of Tylo’s orbit, instead of picking up speed the craft instead sheds it, and after exiting Tylo’s gravity well the JE1 will be in the third green dotted orbit. This let’s me get the JE1 into an elliptical Jool orbit for only 73 m/s, compared to spending 250 or more burning on the periapsis marker of the blue orbit. This kinds of stuff is very cool to me and one of the reasons why I enjoy KSP so much. Of course it’s fun to launch rockets, fly planes, and blow stuff up, but I have really enjoyed learning about orbital mechanics and getting a deeper appreciation for the science and work involved in space navigation. Finally in orbit of the Jool system, it was time to transfer to the moon Tylo and the initial moon landing. 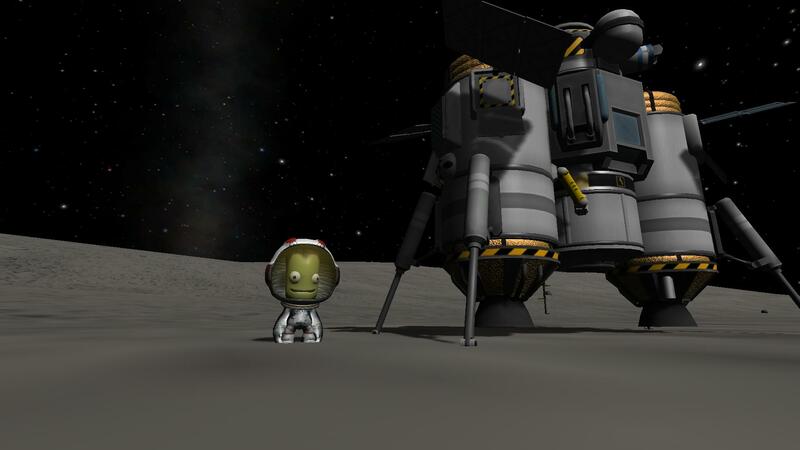 The Tylo rendezvous wasn’t difficult, but it was pretty tedious. First I had to push JE1’s periapsis out to intersect with Tylo’s orbit for 418 meters per second delta V which was about an 8 minutes and 30 second burn. Second, I needed to match inclination with Tylo, so we were orbiting at the same angle, which was another 192 m/s and 4 minutes. It’s not strictly necessary to match inclination but it makes rendezvous far easier to do and I’ve never had any luck without doing it. Lastly I needed to wait two orbits and then burn to bring down my apoapsis (point an orbit furthest from the center) to match Tylo’s orbit, which required 183 m/s and a 3 minutes 47 seconds burn. Again, time warp can’t be used while the ship is under acceleration, so I had about 16 minutes of real time waiting to sit through. While it was really nice to have a design that included so much delta V, it hasn’t really been offset by a much lower TWR, which is why all of these maneuvers were taking so long. I’ll probably not be using this same design on my next big ship. Despite the slight frustration over waiting, I was finally in orbit around Tylo. The first really exciting part of the mission was about to begin. Jeb transferred over to the lander and undocked from the Jool Explorer. After making a save point, because nothing ever goes right the first time, Jeb made a small burn to bring his orbit down close to the planet above a landing site that I selected semi-randomly. My only criteria was to get a different biome than an earlier probe mission so that I could run a full set of science experiments. After passing around the far side of the moon and making a second burn, I create a maneuver for the deorbit burn and waited as the Jool 5 Lander came back around to the daytime side of Tylo. The deorbit burn was 1,495 meters per second, which was 67% of what I had in the descent stage. My plan had been to use that stage for most of the descent and jettison it just before landing. I had a minor moment of panic though because I wasn’t sure how much I would need before actually touching down. In the end I had almost a perfect amount. The remaining 33% was enough to keep my speed down for most of the descent after the deorbit burn finished. 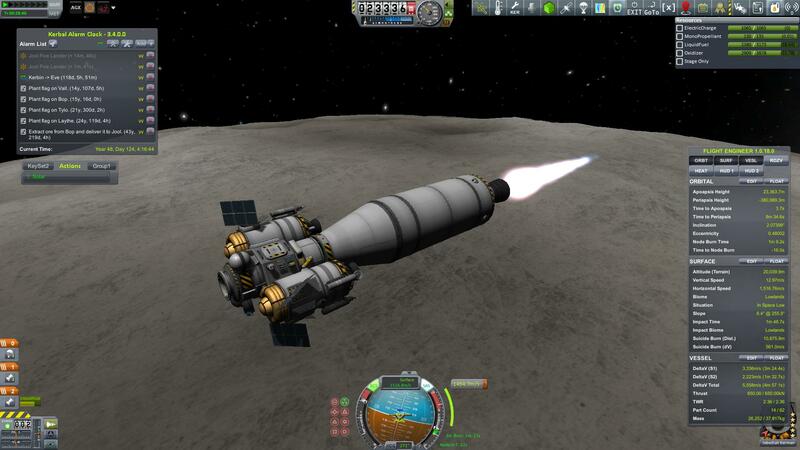 I ended up jettisoning the main descent stage and using about 460 m/s of my ascent stage touching down on the surface. But I had budgeted a few hundred extra meters per second on my ascent stage just for that reason. I thought it might be close, but I was pretty confident Jeb wouldn’t be stuck on the surface. This Tylo landing was one of the more intense things I’ve done in KSP recently. It reminded me quite a bit of when I was first learning to do Mun landings and orbital docking. Trying to keep track of remaining fuel, heading, and descent velocity all while the surface is rushing up to meet you. These are some of the most exhilarating and rewarding activities I’ve ever done in gaming. After planting a flag and running some experiments, I was a little anxious to get Jeb back into space and see if I could get him docked up with the JE1. Taking off from a moon with no atmosphere is pretty straight forward. You throttle up and point the craft to the east at a 45° pitch. East because then you get to add the rotational velocity of the body you’re on to your orbital velocity, and 45° is a good rule of thumb although you can always go lower or higher depending on the terrain. It turned out that my fuel situation was a lot tighter than I realized. The Jool 5 Lander ended up in a 53.5 km by 17.5 km orbit with only 34 m/s fuel remaining. That’s not much, but this was after I had already gotten an intersect of 2.9 km with the Jool Explorer, so all I really needed was for my relative velocity to not be too much over 34 m/s when I got to my rendezvous point. I still have a bunch of monopropellant for RCS thrusters, but those aren’t create for slowing down more than 10 m/s or so. 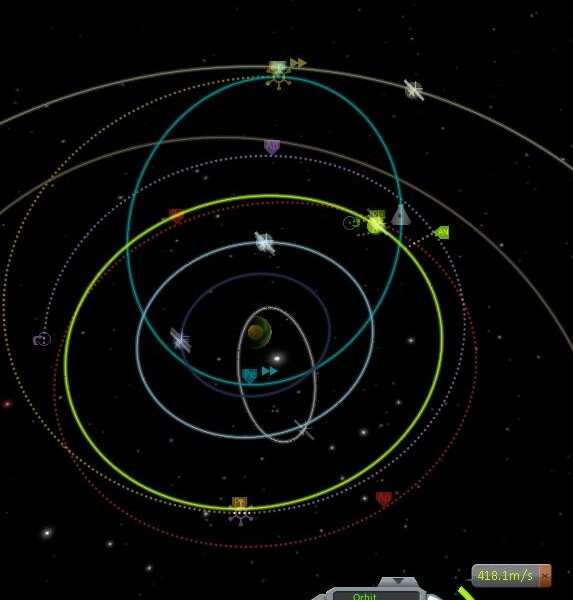 After a last orbit of Tylo, Jeb’s Lander intercepted the Explorer and had a relative velocity of 45 m/s. Ideally it would have been 34 or less, but the remaining 11 m/s after I exhausted the lander’s fuel was easy to take care of with RCS. 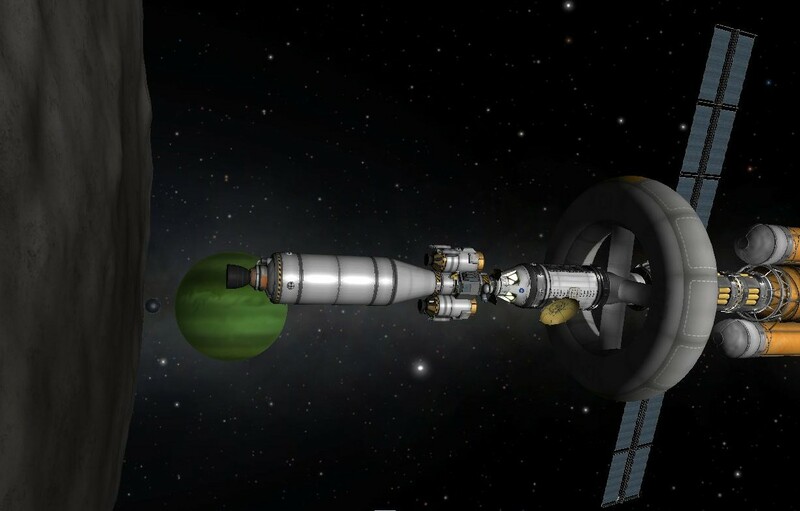 Docking went smoothly and then Jeb transferred back to the Explorer’s crew module bringing along all of the science he’d collected on the surface. The next stage of the mission was to head to Laythe and land, but I ended up using more hydrogen than I expected getting from Kerbin to Tylo. So instead the crew of the JE1 will make for Bop which is where the orbital refinery that I had previously sent out is located. Bop is inclined and the fourth moon in the system, but it has very little gravity which made more sense for mining operations.